enough to prefer to be beaten rather than abandon an attempt to succeed. Samnites' history, after more than two thousand years, continues to fascinate anyone who attempts to penetrate those events that, around the last centuries before the coming of Christ, have influenced the growth of most of the Italics people. At that time so many and such were the events for which fate has changed its way several times, because of the will of those ancient men. Their story crosses with stories of other peoples, like the Etruscans, Greeks, Celts and, almost in a constant confrontation, with the Romans. They were the stubbornest people and they had the more resolute temperament among all the peoples of the peninsula. They were those who, more than anything else, freedom was sacred and those who fought hard to defend it. The interest about their historical events is also dictated by curiosity to trace the still many and obscure happenings that made up their history. Few ruins and traces, although spare, remain today about this people who tried repeatedly to break free from the yoke of those who, from there on, would dominate the whole world until then known. Anyway it was a proud and courageous people who has impressed, for nearly a century, the imprint of their civilization on the lands from Gran Sasso right down to Magna Graecia. The Samnites and the Romans are grew up together and they had been before allied and after enemies in battling for hegemony of that part of Italy which, in the early fourth century b.C., represented the natural expansion for both of them: the fertile lands in the south of the river Liri, until the river Volturno and more down to river Sarno. It is difficult to know what was the factor, human or fortuitous, that allowed the ones to dominate the others. The history of Rome, as we have always learned, is based on epic facts built by the work of chroniclers and historians, many of them enslaved to power of Rome, whose only interest was to celebrate the greatness of the Empire, its great battles and the straining made by the most important men in Rome to overcome all other peoples. Rome first and above all, the strongest. 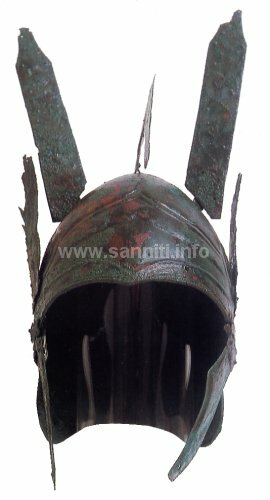 Helmet from Lavello - IV Century b.C. Melfi - National Archaeologic Museum. Dionysius of Halicarnassus, Ptolemy, Fabius Pictor, Pliny the Elder, Strabo, Mela, Velleius Paterculus, Appian, Diodorus Siculus and especially Livy are among the chroniclers, geographers and naturalists who have written in their works on Sannio and the Samnites. But the Samnites, in these ancient texts, are often described in a superficial or confused and often not true way. Even today, some passages by Livy, by Strabo and even by Paul Deacon, are difficult to interpret and makeconfusion even in those who want to rebuild just only the geographic structure of Sannio. Recently, the efforts of the Soprintendenza Archeologica, with new excavations, reconnaissances and the subsequent study of archaeological finds, has enabled a new and different reconstruction of the ancient Samnite society, putting some order into the history of our people. 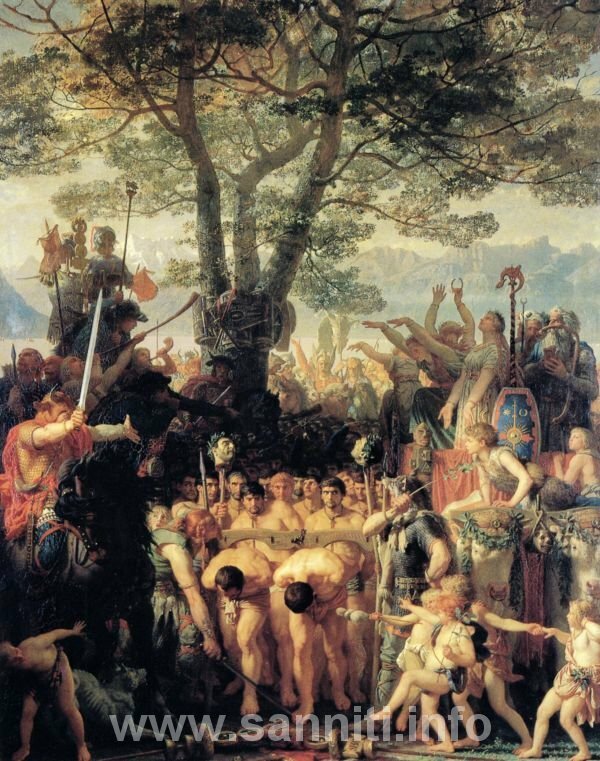 Charles Gleyre - Les Romans passant sous le joug - 1858 Oil on canvas. of Caudine Forks during the Second Samnite War. Currently, to well know the ethnic-cultural heritage left us by the Samnites, you can visit the museums of at least four regions of Italy: Abruzzo, Molise, Lazio and Campania. These are the areas where they lived (this also attests how great was the influence of their customs and traditions on other Italic peoples) but since we can't build, for obvious geographical and political conflicts, one place where only a museum can preserve the remains of this ancient people, so we must wander from town to town to observe the archaeological vestigia of each site that, more than any works, can evidence the importance that the Samnites had in the history of our peninsula. Just think they were the first to use the name "ITALY", to indicate at that time, those areas, from the Tyrrhenian to the Adriatic sea, united to fight the hegemony of Rome. 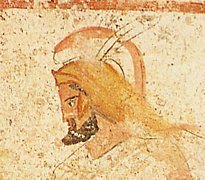 This website aims to be a window on the ancient world of the Samnites, a contribution to knowledge of a proud Italic people, recounting the origins and historical events through a text, simple and free from artificial words typical of the technical descriptions, accompanied by a series of illustrations of archaeological finds from all over the territory that once formed the ancient Sannio, in order to provide an permanent framework of the actual situation (many of the findings presented in this website aren't anywhere else). There are archaeological remains of all the Samnites tribes. We will talk about Pentrans, Caudinans, Carricinans, Hirpinans, and also Frentans, Lucans and Campans. The website takes its cue from historical and archaeological documents and researches that have been published on the subject in recent years, relying on classical works and illustrating the best possible way, using images taken from the archive's staff, the various places and archaeological finds mentioned and described in the unfolding of the narrative. In addition, many are the consulted texts, which are based on descriptions and reports relating to the epic knowledge, and listed in a bibliography that could be called "classical" because it contains all the texts, most of them published over the last century. Paestum - IV century b.C. are the sources of reference which, when they are not listed in the bottom of each page you can includ them in the bibliography in the special section. When you update and expand the subject-matter, sometimes you can find new and inexplicable events, such as the relationships between Samnites and Celts which, according to some archaeological evidences, seem to be much more frequent and assiduous than the historical traditions gave us. Others testimonies don't have an historical and immediate feedback and so we have difficulty to place them both in temporal and in logic disposition. You will know it browsing this site. We would take up cudgels for those who have archaeological artefacts found by chance in their own house. These people may not know the real value of the items in their possession and they don't want to discard them or lease them to the competent authorities for not having legal sanctions or for the fear that, once delivered, they can't "see" them anymore. This site is available to them to facilitate and help them to make public their treasure, to allow everyone to benefit from the knowledge of ancient artifacts that otherwise would be lost. We will maintain their anonymity if they want, we will help them to deliver the findings to appropriate authorities. Italian laws protect and reward those who help to preserve the historical and cultural heritage of the peninsula. And now, good navigation, remembering that at the bottom of each page there are navigation buttons, or a Samnite Kardiophilax (an ancient shield) between two Romans swords. Clicking the mouse pointer on the sword on the left, you leads to the Previous Page, and clicking on the sword on the right, you leads to the Next Page. Pressing the Samnite Kardiophilax will always return to the homepage. Some pictures of archaeological findings have an alternative text that you can start moving the mouse pointer on them. An inscription on a white label will appear for disappearing a few seconds later. This alternative text is present especially in those pictures that not have captions. Finally do not forget to always see the section "Researches and Studies" accessible from the Homepage. There are several articles to read and many novelties in the field of archaeological research.